Whether you’re a grandparent, a grandchild, or someone who’s curious about what we’re doing to leave the world a little better than we found it, we appreciate you being here. We believe that our collection of stories and the lessons that grow out of them will make great teachers – and the more, the better. We’d love to hear from you and learn from your experience too. Just click on the button at the bottom of this page to send an email with a story or photo you’d like to share. Please join our community on Facebook, Twitter, and Instagram as well. We’ll look forward to seeing you there. We'd love to hear your thoughts about what we're sharing, and we'd love to share your thoughts for others to hear. 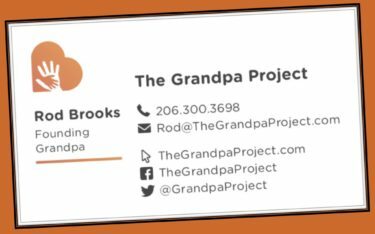 Thanks for visiting The Grandpa Project.